In yesterday’s article, I posted several of my recent dahlia photos. This year, I have my new Canon 85mm f/1.2 L lens and I wanted to experiment with bokeh. But, this lens has a minimum focusing distance of over 3 feet, not the best for this type of subject. There are alternatives for macro photography. 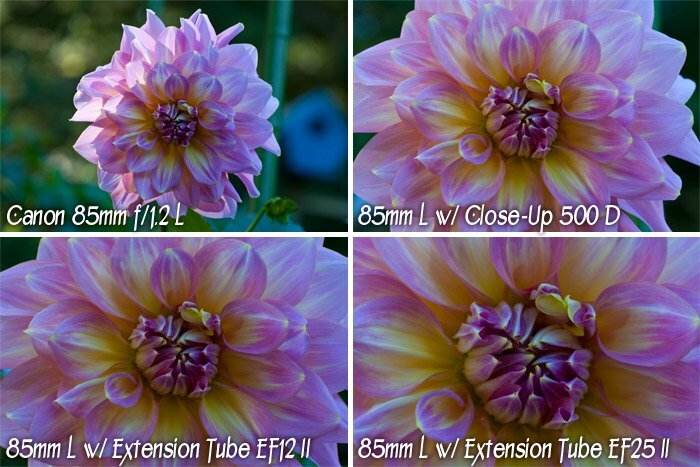 I have discussed Extension Tubes before. I was planning to use either the EF12 II or EF25 II with the 85mm f/1.2 L. In packing my bag, I went through my collection and found Canon’s Close-Up Lens 500 D which screws on the front of a lens like a big filter. I completely forgot that I had this! Many reviewers have raved about this multi-element filter was on par with L-quality glass. In fact, it is so heavy that it outweighs both extension tubes together with a pouch! That’s why I put is aside and have not used it since. But, my Tenba Shootout has plenty of room, so it’s worth bringing along for a comparison. Each of the above photos were taken of the same flower. Without any attachment, I had to be about 3.5 feet away in order to get a focus lock on the center of the dahlia. Each of the other photos represent the closest I could get with the stated attachment while achieving a focus lock. 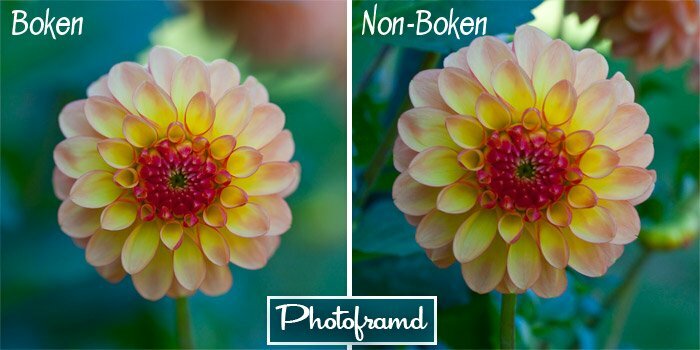 In terms of image quality, all photos are virtually the same with equal sharpness and color accuracy. I was very surprised by the Close-up Lens. It reduced the minimum focusing distance to under 1-foot while allowing me to capture more of the flower than the EF12 Extension Tube. With the Close-up Lens attached, I was still able to open the 85mm up to a f/1.8 for some great bokeh effects. After putting the Extension Tubes back in my bag, I spent the rest of my time using the Close-up Filter. I was very pleased with the results. Thank you! I hope to take more dalhia photos at today’s show!